Communication is key to workplace efficiency. And there are times when that communication requires face-to-face meetings. These meetings can be a model of efficiency or go on forever with no measurable accomplishments. Setting up an effective meeting is more than emailing the time and location to attendees. With a little planning and extra effort, you can run meetings that meet objectives, produce results, and leave participants with a sense of accomplishment. Do you even really need to have the meeting? Arrange for someone to take detailed notes during the meeting – that way you can focus on keeping the meeting on track. Encourage them to keep a summary of discussion points being made, actions steps, and decisions. 3. Who to include: Don’t waste people’s time -- it’s too valuable. Participants should either be decision-makers or essential to the process. Not sure if someone should be included? Ask if they would like to attend or would prefer to receive the minutes later. 4. Be punctual: Respect the time and effort of those that show up on time. 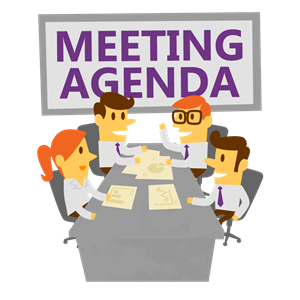 Don’t delay the meeting due to the tardiness of other attendees (and don’t waste time updating latecomers). 5. Keep on track: Keep everyone focused on the agenda. If unrelated discussion topics arise, get them back on track -- rambling, non-relevant discussions are disruptive and impact work flow. Provide a quick summary after each agenda topic, confirm everyone agrees that it’s accurate, and then move on. 6. Stay on schedule: End the meeting on time. If it’s running behind, push for a decision, table the discussion, or schedule a separate meeting on that topic. 7. Participation: There is always one or two people that love to hear themselves talk. Avoid letting them dominate the discussion. Is someone is dominating, ask others (by name) for their thoughts. It’s critical that everyone contribute. If their input isn’t important or necessary, is their attendance really necessary? 8. Follow up: Send a follow-up summary as soon as possible. Include information on what was accomplished, decisions that were made, assigned action items, and next steps. Ask for feedback on how the meeting could have been improved. Remember, effective meetings successfully accomplish their objective in a minimum amount of time, have good attendee participation, and leave people with a clear sense of the next steps to be taken. You won’t get it perfect the first time – maybe not even the first few times. But, your efforts will be appreciated and practice makes perfect!